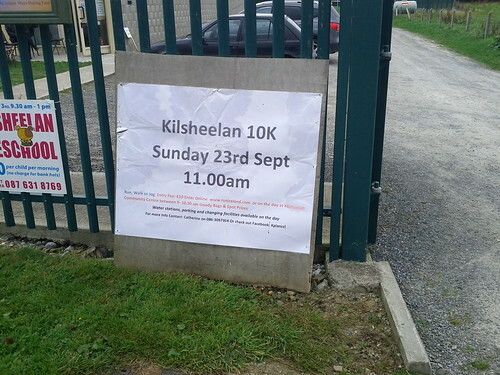 Kilsheelan 10km, a photo by miguelpdl on Flickr. Had a great run this morning in Kilsheelan (Tipperary, Ireland). Measured 43:12 on my watch and the time keeper shouted 43:13 as I crossed the line. Shaved 17 secs off my PB and I’m really happy with the event. I was hoping to break the 43 min barrier, but what the hell this was the best run of the year so far. Made a decision not to us the GPS tracker on this run, and I didn’t find it had too much of an effect as each KM was well marked along the route. Having all the kiddos cheering at the end was fantastic too. Must say the after care in the town hall was just brillant as well.